Martin Harless was born on 25 July 1738. He was the son of Johan Philip Harless and Anna Margarette Price. Martin Harless married Catherine Lingel, daughter of Johan Jacob Lingel and Anna Ursula Banckhard, circa 1754. Martin Harless died 1820 in Giles County, Virginia. ESTHER ELLEN HARLESS, age 87 of Huntington, W.Va., died Thursday, November 26, 2015, at her home in Wyngate Senior Living Community in Barboursville, W.Va. She was born July 8, 1928, in Logan, W.Va., a daughter of the late Luther Jasper and Velerie McComas Harless. In addition to her parents, Esther was preceded in death by her sister, Bernice Shelton. She retired from C&P Telephone. She was a member of Southside United Methodist Church where she also served as a Sunday school teacher and for many years as the conference delegate. Esther loved her God and her church and was active in many ministries of her church. She is survived by one nephew and his wife, David and Carol Shelton and their daughter Brittany Calloway; one niece and her husband, Kathy and Berlin Meredith and their sons Keenan and Josh Meredith. A graveside service will be conducted in the Abbey of Remembrance at Woodmere Memorial Park in Huntington, W.Va., at 2 p.m. Tuesday, December 1, 2015, with Rev. Jim Richards officiating. In lieu of flowers and cards, the family asks you to give to in celebration of Esther’s love for missions. Rollins Funeral Home is assisting the family with the arrangements. Published in The Herald-Dispatch on Nov. 30, 2015. Parents: Luther Jasper Harless and Valeria F. McComas. Relationship to Johan Philip Harless: 5th great-granddaughter and 6th great-granddaughter. Nancy Harless and Jasper Burk Harless. Jasper Burk Harless and Nancy Harless. Dr. Charles Harless “Chas” passed away the morning of October 14th in the peace and comfort of his home while surrounded by family. Charles was born on September 30, 1927 to Charles F. Harless Sr. and Mamie Harless in Durham, NC. His childhood was spent in Chapel Hill until age 10 when his family moved to Sanford, NC where his parents lived out their lives. At an early age Charles was recognized for having a beautiful singing voice and he won first place, receiving the highest marks possible, in the state competition for unchanged voices. He performed throughout his high school and college years then continued in church choirs as a soloist and graced many weddings including those of his children. After graduating from high school Charles served a year in the Navy near the end of World War II. He graduated from the University of North Carolina at Chapel Hill and continued on to Dental School; graduating with UNC’s first Dental Class in 1954. Charles then joined the Air Force starting out in Colorado where he met his wife Paula. His family moved around the world being stationed in England, Texas, Florida, a tour in Viet Nam, Germany, and again in Florida before retiring in 1974 with 20 years of military service. Charles returned to Raleigh, and the state he always loved, to establish his private practice in Periodontal Medicine. He cared for his patients dearly and delighted in his daily interactions with them for another 28 years, finally retiring at age 75. Chas was also an avid golfer becoming a member of North Ridge Country Club in 1980 which served as his second home when he retired. He kept a sharp mind working crossword puzzles, endlessly remembering and telling offbeat jokes, talking politics, and expressing opinions on any topic just for the fun of stirring things up. Chas is survived by his wife of 58 years Paula, sons Jeffrey C. and Clay R. of Raleigh, Dr J. Matthew Harless of Roanoke, VA, stepsons Steven and Michael of Raleigh, a sister, Shirley Scott & husband of Boulder, Colorado, and 6 grandchildren. The progression of melanoma cancer shortened his time with us but we will continue to smile, laugh, show kindness, stay curious and always thoughtful as we remember him for the remainder of our days. The family is inviting friends to share their memories of Chas with them at North Ridge Country Club, October 22nd, between 3:00 and 6:00 pm. Parents: Charles Frederick Harless and Mamie A. Yarborough. Known Children: Jeffrey C. Harless, James Matthew Harless, Clay R. Harless. I look through a lot of records, some are quite boring if I’m perfectly honest, but most are interesting or informative and once in a while one makes me smile. Today I smiled. It wasn’t a happy subject. I was searching through military headstone applications on Ancestry.com, which right away tells you the subject matter is pretty gloomy. The record that brought a smile to my face was that for Lloyd Charles Harless. On 29 December 1939, just 8 days after his 18th birthday, Lloyd enlisted in the United States Army. World War 2 had begun, but the United States was not militarily involved and the Selective Training and Service Act of 1940 was not yet instituted. This meant that Lloyd had not been required to register for the draft and so by all accounts his enlistment in the army was a voluntary one. As the oldest son, perhaps he felt it was his duty, or perhaps he wanted to follow in his father’s footsteps. Lloyd’s father, Lissus H. Harless, had served in World War 1 when he too was just a teenager. I don’t know much about Lloyd’s military service. I do know that in 1940 he was stationed at Fort Preble in Maine and that he served in the 439th Anti-Aircaft Artillery Battalion. On 31 July 1944 Lloyd Charles Harless was killed in action. He was 22 years old. I have not searched the Graves Registration Records as yet, but from his unit information it appears he was killed in Italy fighting in the Rome-Arno Campaign when the 439th was temporarily converted to infantry duty in Task Force 45. From the headstone application made by his father and shown here, we know that his body was returned to his family for burial in the US. I know you are wondering how any of this could have made me smile. I smiled because I checked the reverse of the card. How many times do we forget to do that? We’ve seen the front, we have the information we were looking for, on the back we expect to see nothing more than an address or a few date stamps, but when I checked the back of Lissus H. Harless’s application for a military headstone for his hero son, I saw his pride. I saw his pride and that made me smile. I hope it made you smile too. Here is where I found the record, there are several more Harless soldiers in the collection. Parents: Lissus H. Harless and June Augusta Hager. 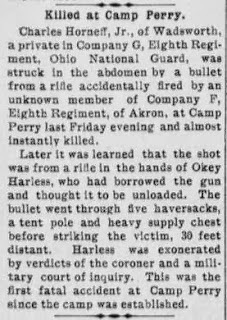 Charles Horneff [sic], Jr., of Wadsworth, a private in Company G, Eight Regiment, Ohio National Guard, was struck in the abdomen by a bullet from a rifle accidentally fired by an unknown member of Company F, Eighth Regiment, of Akron, at Camp Perry last Friday evening and almost instantly killed. Later it was learned that the shot was from a rifle in the hands of Okey Harless who had borrowed the gun and thought it to be unloaded. The bullet went through five haversacks, a tent pole and heavy supply chest before striking the victim, 30 feet distant. Harless was exonerated by verdicts of the coroner and a military court of inquiry. This was the first fatal accident at Camp Perry since the camp was established. 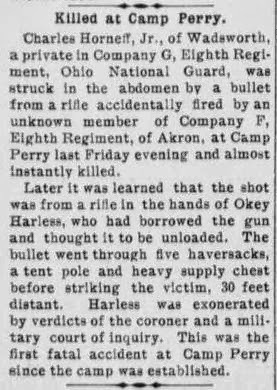 Killed at Camp Perry, The News-Herald, Hillsboro, Ohio, 5 August 1909, page 4, column 1. The dead man, Charles Hornoff, Jr., was just 23 years old, the same age as Okey Harless. 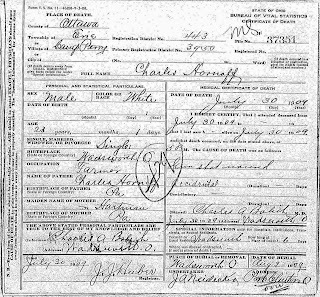 Charles was born on 13 May 1886 in Guilford, Medina County, Ohio, to Charles Hornoff, Sr. and Emma M. Hartman. 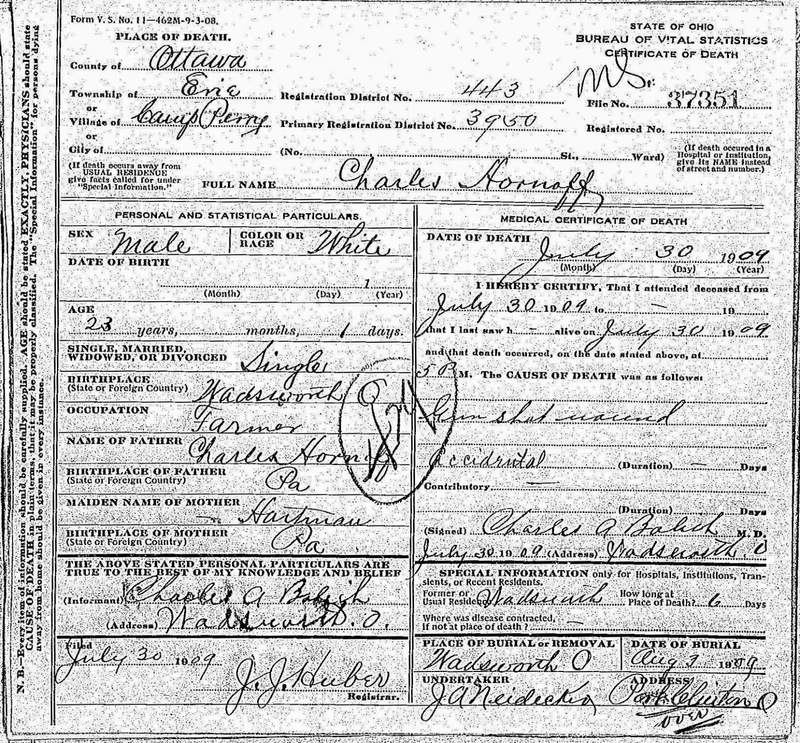 Charles Hornoff, Certificate of Death number 37351 (30 July 1909), Bureau of Vital Statistics, Ohio. Okey Harless was the son of William Henry Harless and Frances Fernelia Keffer. He was born on 11 June 1886 in Iola, Roane County, West Virginia. Okey died on 7 March 1957 in Vienna, Wood County, West Virginia. Parents: William Henry Harless and Frances Fernelia Keffer. Relationship to Johan Philip Harless: 3rd great-grandson and 4th great-grandson.